Is sushi eaten with your hands? Or should you use chopsticks? Sushi was originally a food eaten with your hands. 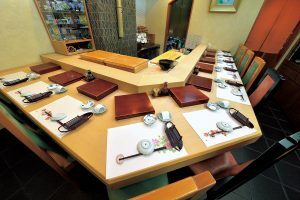 Even, for example, if you are in a prestigious sushi restaurant in Ginza, you can still eat with your hands. You can actually use your hands to eat the ginger too. 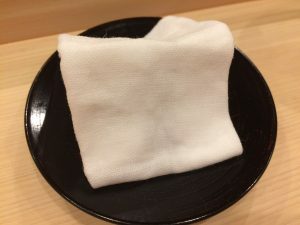 Restaurants that prefer you to eat with your hands will provide an extra, smaller towel for cleaning your hands between sushi, along with the normal hand towel. Even then, feel free to use chopsticks if you prefer. Posted on February 12, 2018 Categories Basic KnowledgeTags Edomaesushi, Sushi etiquette, Table MannersLeave a comment on Is sushi eaten with your hands? Or should you use chopsticks? There are manners in using chopsticks that tourists may be unaware of. I would like to introduce some of those here. First of all, it is impolite to place chopsticks on your dish in the middle of a meal. Make sure to place them back on the chopstick stand when you aren’t using them. It is also poor manners to stab food with chopsticks and or to use chopsticks to look through dishes. Please avoid breaking up the beautifully arranged dishes when you eat. Why aren’t the prices included on the menu at sushi restaurants? If you visit a premium sushi restaurant, such as one that places piles of salt by the entrance for good fortune, you’ll notice there are no price displays. There’s not even a menu. All you find is a slab of wood hanging down the wall with names of the daily offerings such as Conger Eel (anago) or Spotted Shad (kohada). This is not a place to get angry and ask how customers can order without knowing the price. 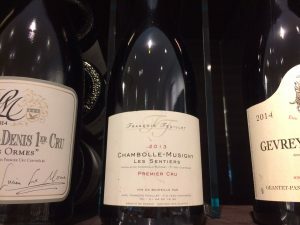 First time customers may not know the market price and worry about budget, resolving to pay with a credit card if they don’t have enough cash in their wallet. I guess you could say that sushi restaurants that don’t display prices are accepted by customers as being more traditional, like the old days. But actually, at pre-war sushi restaurants, there were wooden panels that listed prices such as “Fatty Tuna: 2000 yen”. It was during the 1960s that they stopped displaying prices. The 60s was the start of an era of high-growth in Japan. Prices were rising rapidly and sushi prices also went up drastically. 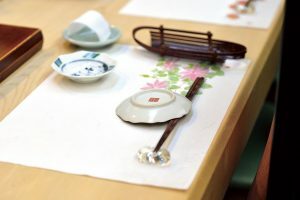 At the same time, the business practice of entertaining clients was gaining popularity and suddenly about 80% of the clientele of high-quality sushi restaurants were these types of business groups, rather than individual customers. In situations like these, if there was a sign that read “Medium Fatty Tuna: 3000 yen” then it makes it difficult for the business guest to order what they like, without worrying about the price. Considering the total bill, they may also order fewer dishes than they want. As you can see, this practice of not displaying prices at sushi restaurants was in consideration for the business customers who were entertaining clients, as well as those being entertained as clients. 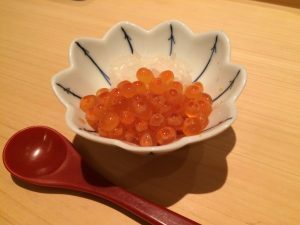 At the same time, the well-known “Omakase” was created, the “chef’s choice” system in which the customer orders a menu created by the chef on the spot. 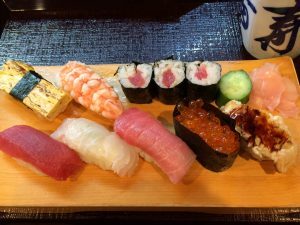 Posted on October 23, 2017 September 11, 2018 Categories TriviaTags Ginza, Nigiri sushi, Sushi etiquette, Table MannersLeave a comment on Why aren’t the prices included on the menu at sushi restaurants? Hier lernen Sie alle Benimmregeln, die nicht nur in Sushi-Lokalen, sondern in allen Gaststätten Japans gelten. Das Wichtigste ist wohl, auf andere Rücksicht zu nehmen sodass sich andere Gäste im Lokal nicht gestört fühlen. Rücksichtnahme – das ist wohl das Wesentliche im japanischen Leben. Bitte merken Sie sich die hier aufgeführten Punkte. ・Bitte kommen Sie nicht zu spät, halten Sie die Reservierungszeit ein. ・Es gibt zwar keine bestimmte Kleiderordnung, doch es ist ratsam, sauber und dem Anlass entsprechend gekleidet zu sein. ・Ein Ihnen vorgesetztes Sushi sollte sofort verzehrt werden. Optimal ist: Innerhalb von 10 Sekunden. ・Um das delikate Gleichgewicht von Reis und Sushi-Belag optimal zu geniessen, sollte man am besten das ganze Sushi-Stück in den Mund stecken. In diesem Sinne ist davon abzuraten, den Belag vom Reisklumpen zu trennen. ・Fische und Meeresfrüchte aus natürlichem Fang schmecken in der jeweiligen Saison am besten. Wir empfehlen, saisongerechte Beläge zu wählen. ・Dippen mit zu viel Sojasauce ist nicht ratsam. Der Sushireis saugt die Sojasauce schnell ein und dann zerfällt der Reis in Klumpen. Zu viel Sojasauce stört auch den feinen Geschmack des weissen Fischfleischs. ・Eine geregelte Reihenfolge gibt es beim Sushi-Essen nicht. Sie können völlig frei wählen, mit welchem Sushi Sie starten und welchen Sie als nächsten essen. 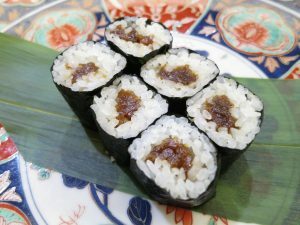 ・Ein echter Sushi-Kenner bleibt nicht noch lange sitzen, wenn er fertig gegessen hat. Sich nach dem Essen zu lange in einem Sushi-Lokal aufzuhalten, gilt in Japan als uncool. Is it polite to use Gari as a brush to apply soy sauce? Using too much soy sauce spoils delicious sushi so make sure to only put a bit of soy sauce in the special dish. Make sure to tilt the sushi to the side and put just a dab on the end of the topping. Gari can be used as a brush to apply soy sauce to sushi rolls since they cannot be tilted. However, there are differing opinions as to whether this is a refined way to eat or not. Many people say it was basically made up by a publishing company. You just need a few drops in the soy sauce cruet. Actually at very fancy establishments the sushi is served with Nikiri so normal soy sauce is never used for dipping. Posted on July 26, 2017 Categories EdomaesushiTags Gari, Nigiri sushi, Nikiri, Sushi etiquette, Table MannersLeave a comment on Is it polite to use Gari as a brush to apply soy sauce?